Today was the Lumbar Puncture, and it went quite well. Thank you, to all of you, who sent me positive vibes and love, I’m certain that I was surrounded with so much positive energy that it couldn’t HELP but increase the chances for a good outcome. You are all stellar, take a bow, star-stuff folks! As usual, the nurses and docs at St. John’s were terrific, my only complaint was after the procedure I was STARVING (thank you, Dexamethasone…) and I was about to eat someone’s arm off before they got me the bagel I’d ordered AN HOUR BEFORE. After a procedure, like my port placement or the LP today, they allow you to order a light meal since these are fasting procedures. The food’s always been crazy fast, but today I couldn’t get a bagel for love nor money. You do NOT get between a woman on Dex and her bagel, it’s just NOT DONE.. Tomorrow I’m at a new place, Woodwinds in Woodbury, MN. I’ll be under sedation for a Bone Marrow Biopsy, and then I’ll be home resting the remainder of the day. Wait until THEY hear me roaring for food after my procedure! Friday is my last diagnostic test, it’s a PET Scan back at St. Johns (this is the test I screwed up on Tuesday when I ATE before instead of fasting!) I’m really thrilled they were able to get me in so quickly. I hoped that if I’d be able to get the test done THIS WEEK, then next Tuesday when I meet with my medical oncologist he’ll have the info he needs to decide which chemo drugs to mix up for me. So I’ll be waiting around for a few days. But, at it’s heart, that’s what a great deal of life is, and I’m prepared with needles, yarn and several amazing audio books. For me, knitting is the tool that allows me to move from a frustrated, can-hardly-stand-to-be-in-a-waiting-room person to a woman who is just a tiny bit happy to have a few moments to sneak in a couple of beautiful rows and make myself very happy. I’m VERY fortunate to be starting the FIFTH version of a new pattern. It’s a baby blanket that is based, loosely, on the Fibonacci Number. Mostly it’s just a way to do more mitering using interesting colors juxtaposed against white. 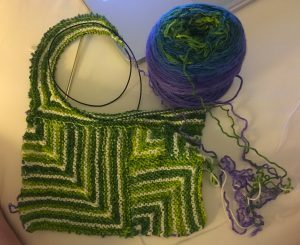 I’m re-knitting this project SO much because I want it to be a Universal Pattern, meaning it can be used with ANY of our bases, ANY weight yarn, and still get a nice result. 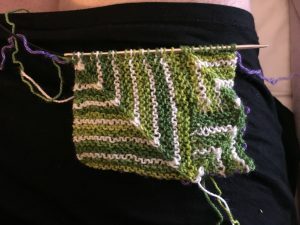 In the current incarnation of this pattern I’m using Pearl as our neutral contrast, but the main color ISN’T one of our FLOWS or Variegated Colors. Working on Mitered Square #5 off of an “artistic” blank. I’m VERY disappointed that I didn’t photograph this “masterpiece” of dyeing, It really WAS a lovely blank! If we end up marketing these, I think I want to present them already in balls, but with a photo of the original blank on the package. 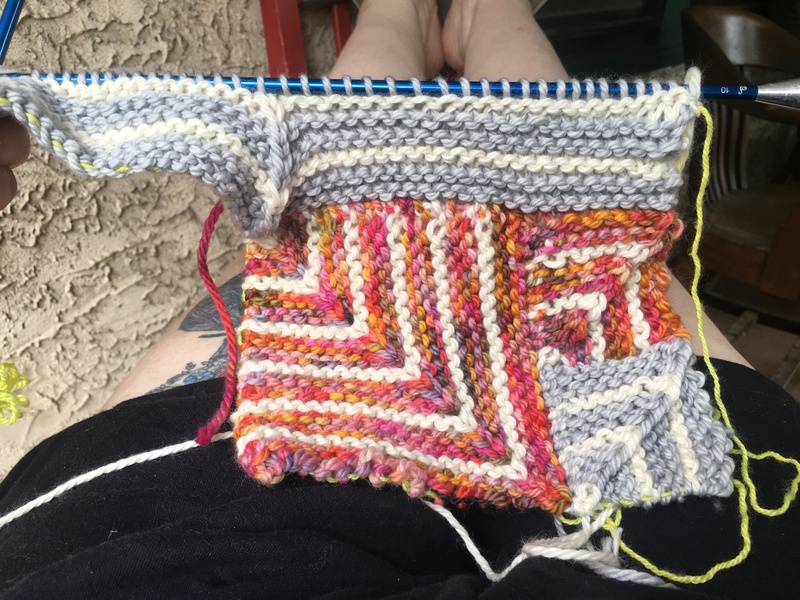 Since I knit/dye two blanks worked together, I can’t just sell the blank, that would be TOO hard to work off of (two strands??) for the average knitter. Hell, it would be very awkward for me! Essentially, it would mean ripping out the blank as I worked it. But, in addition to the yarn I would be working with, there would be an equivalent amount of yarn to roll into a SECOND ball as the blank yarn was knit. This is just too confusing and would be bound to cause a lot of knots and tsuris! The way I knit our blanks (yes, I knit them, I don’t purchase pre-knit ones) I put TWO strands together for the sock weight bases, which means when I dyed this blank I ended up with two matching balls of yarn. In this pattern, there are 2 balls of color, and 1 ball of neutral. 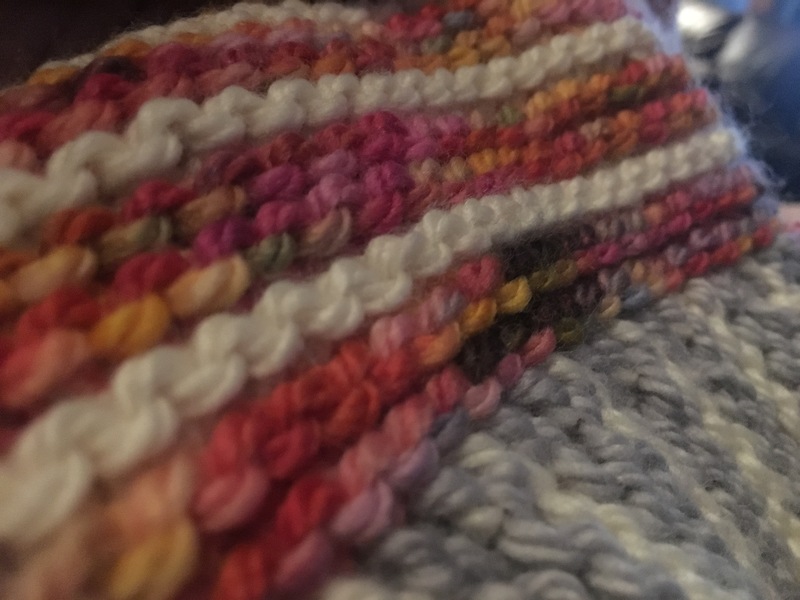 I alternate the colors with a neutral, using 2/3 highly colored & 1/3 neutral color yarn in the project, I think that gives a really nice balance. I’ll work on one color yarn-from-blank ball from the inside out, then switch to the second ball working in the opposite direction, the colors should ebb and flow nicely. Well, that’s the plan. I still haven’t gotten to the BLUE part of the yarn, THAT’S what I’m waiting for! I have to say, though, the colors really ARE lovely! But I’m such a sucker for green and blue and purple that I’d love it no matter what. So scattered through this post are a few shots of the piece so far, I’m still in the “green” area of the painting, I can’t wait to see how the whole balance of color changes as I move into the blue and purple areas! If it seems like a lot of work for a very SIMPLE pattern, it is. My own mind is a bit scattered right now, and re-knitting something I’ve done several times is just about my speed. 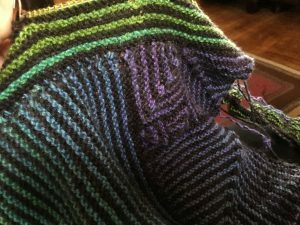 You can learn SO MUCH when you redo a design, and I’m hoping that this pattern will have very helpful tips that will improve future mitering projects for the knitter. 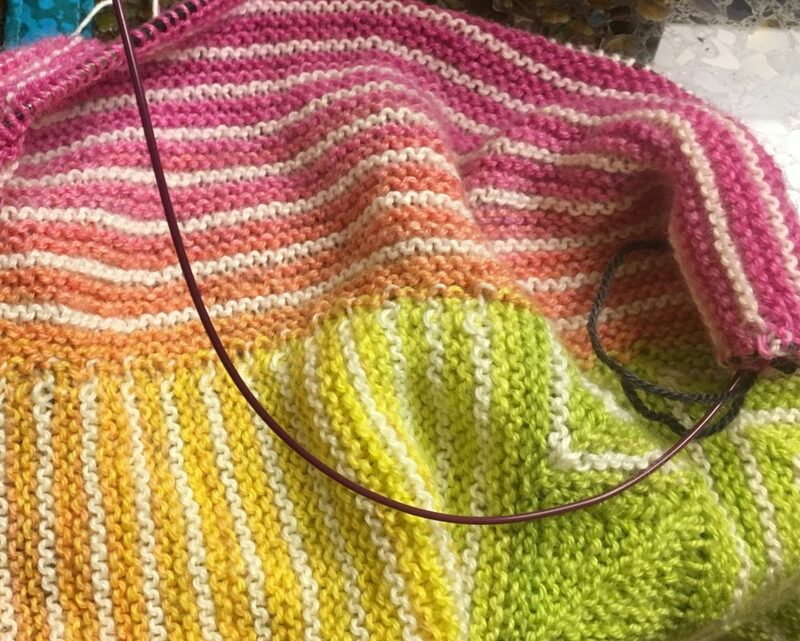 And I’ve come to the conclusion that GARTER STITCH is such a lovely fabric, it makes me feel at peace with little or no effort. Excellent radiation brain knitting! But today I learned that yarn and patterns and ME, myself, haven’t been the only things waiting for something to happen. Apparently my tumor has been a sneaky pete, waiting in the wings, hiding in places where only an MRI would find it. I can’t be TOO angry at the tumor, after all, I made it. And I’m enough of a crafty woman to appreciate a good (artistic?) creation. 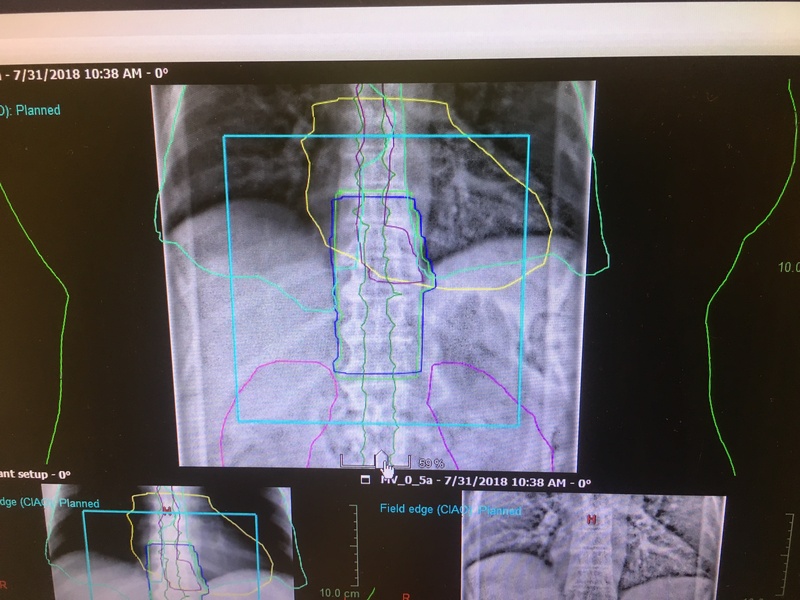 The tumor has grown straight (well, not really in-a-line-straight) through my T10 vertebra and is going into my T9. There’s also some growth to the right, which I can feel, which is the weirdest thing in the world. No one has an idea HOW long the danged thing’s been growing. How long have I HAD Lymphoma? 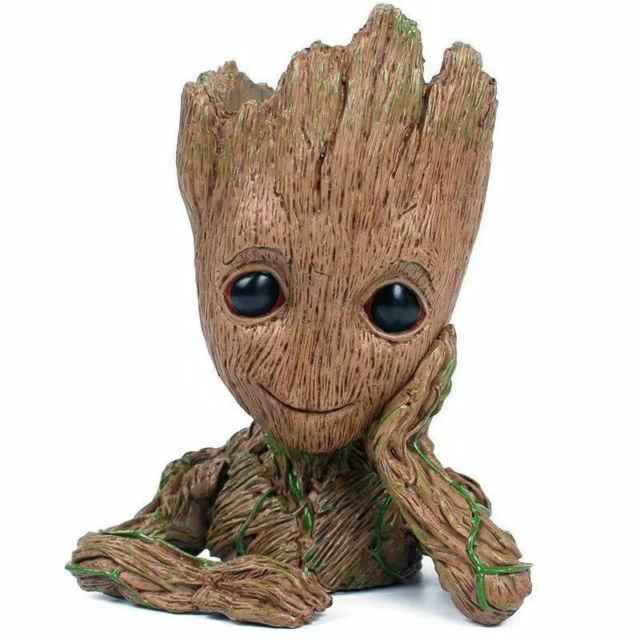 And, apropos of nothing, I keep imagining my tumor growing like Little Groot. Probably the absolute LAST kind of imaging I need to do as I “think” this tumor away, but I can’t stop. It just LOOKED like Groot in the MRI. I’m a nut. Gerry wonders if I EVER had Fibromyalgia, that perhaps it was Lymphoma all along. I’ve been exhausted, in pain, but nothing that seemed extra “tumor-esque” And it took an MRI to even see this tumor, a couple of Xrays and a CT Scan didn’t really show anything. I’ve spent the past 2 weeks receiving radiation treatments to shrink the spine tumor. Even though the treatments are done, the little rays are still zapping around in there, doing their work! Will they be successful? We’ll have to WAIT. I’m trying to come to peace with the fact that I was clueless (on a conscious level) of something so huge happening within in my body. I think I am better at discerning trouble in Gerry, whether a return of his dreaded M-Spike or an impending, unexpected Heart Condition, than I am in seeing/feeling/knowing that something is amiss in my own body. Caregiver is a hard role to slough off. Patient is a harder role to inhabit. Thankfully I have my costumes picked out for me, and I have my waiting room knitting! This entry was posted in Current Projects, Designing, Health, Lymphoma and tagged Blanket, Fibonacci, Mitering, waiting by Annie Modesitt. Bookmark the permalink. I cannot believe you knit your own blanks!!! I have definitely seen ones knit with two strands held together, so that if you chose to re-knit them into socks, you can get a perfectly-matching pair. But they were all machine-cranked, as far as I could tell! Not knowing is much worse than knowing, in my experience, and I think in most people’s experience. But it also has been my experience that experience builds up. I know this sounds direct from the department of duh, but as you go thru an icky test like lumbar puncture, then bone marrow biopsy, then port placement, you build chops to get thru the next weirdly ugly deal with less stress. And then one day you’ll have a month of crap behind you, then a year, then a decade. And voila!, you have built resilience. Simple, right? Left foot, right foot…. I can feel a calmness coming off your writing today, a strength that suggests energy is moving towards where it needs to be. Very impressive. I hope tomorrow goes as well as yesterday did, and you aren’t kept waiting for answers…or bagels. I feel the same way. Less edgy. I think I had to go through the “edgy writing part” to begin to see this part of the hill. I am so glad that you have your knitting to help you through! Sending more positive thoughts your way (they’re trailing along with the yarn order I just placed…). Best of luck! Thank you so much for the order! We REALLY do appreciate it! 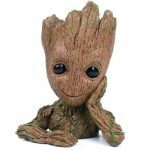 Some ideas born out of experience – women who work & take care of others (children, spouses, others) tend to minimize their own internal stuff (mind & body) because there’s just so much time in a day to get all of the regular tasks of daily living accomplished. We just don’t have enough time or energy for anything that can be put aside or ignored. It’s not an excuse – just a fact of life. There is a huge group of us thinking about you, hoping for comfort as you work through this insult to a busy & wonderfully creative friend. Keep on . . . .